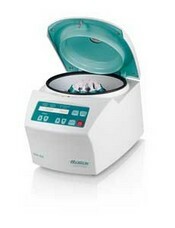 The EBA 200 is a small & portable centrifuge. Perfect for on-call and smaller laboratories with an 8 place rotor.Microprocessor-controlled. Variable – it accommodates various tubes from 13mm x 75mm Vacutainers™ to 16mm x 100mm Sarstedt™ Blood tubes.